Choosing the LaBuda team was hands down, best decision we made to sell our family home. From our first meeting through closing, they were quick to respond and inform us. Each member of the team walked us through every step of the process. Jo-Anne, Lynn, Jennie and Terri were absolutely fantastic! True dream team!!! Our experience with LaBuda Advantage was excellent. Our agent, Lynn Nadler, was very knowledgeable and professional. She gave us good advice in every step of the process. Have used the LaBuda team for two real estate transactions. Everyone is extremely focused and helpful throughout the process. Erin LaBuda is especially attentive and helpful, she will not stop until she does the best possible job for her clients. When we return to Columbus in the future we will be calling Erin first thing! The process was nearly seamless, simplified by our realtor, Lynn Nadler. We couldn’t be happier with Lynn or with LaBuda’s entire team. Highly recommend. We worked with Lynn Nadler and she did a great job navigating our purchase of a new home and sale of our existing home. 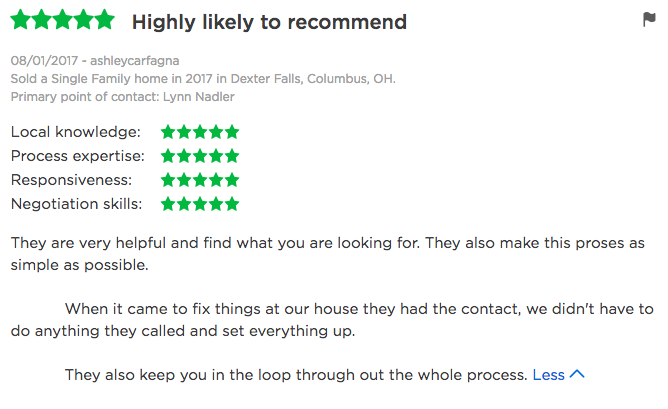 We would strongly recommend Lynn and the entire LaBuda team! I received excellent service!! I would highly recommend this team of real estate professionals!! I was kept informed every step of the way and I could call a number of people if I needed anything. Excellent service. They kept in the loop as to what was going on and always answered promptly. Was very helpful with accepting an offer. Very helpful with things I didn’t understand. Very professional and organized approach to selling my home. Worked hard to market the house, negotiate an offer agreement, and ensure pre-close activities were completed correctly and on time. Lynn Nadler and the LaBuda Advantage team were knowledgeable, professional and were a major asset in getting my home sold. They had great insight into the local market and routinely presented facts and data to back up their opinions. I would definitely recommend Lynn and the LaBuda team. They are very helpful and find what you are looking for. They also make this proses as simple as possible. When it came to fix things at our house they had the contact, we didn’t have to do anything they called and set everything up. They also keep you in the loop through out the whole process. Erin LaBuda was awesome to work with! She had a solid knowledge of local neighborhoods, homes, and excellent contractors to use. She was always easy to get a hold of and very responsive when we contacted her. The LaBuda team (especially agent Lynn Nadler) are fantastic! They helped us sell our home in 1 day, and helped us “win” our new home with a listing that had 10 showings and 7 offers in 1 day. Lynn showed creativity in the drafting of the offer, kept us updated throughout the process, and then walked us through the inspection and closing process. Lynn’s team was very responsive to our needs, and excellent with communications as we juggled the sale and purchase of two properties. 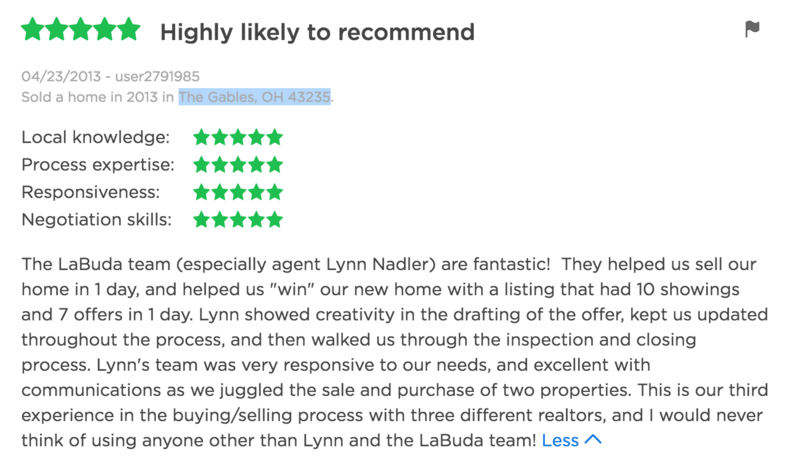 This is our third experience in the buying/selling process with three different realtors, and I would never think of using anyone other than Lynn and the LaBuda team! Joanne LaBuda takes a personal interest in her clients. She is patient and encouraging. There is no doubt the client’s best interest is foremost in her thoughts and actions. She is a wonderful person and agent. We can’t say enough about the entire LaBuda Advantage team — their deep experience shows in everything they do. Great knowledge of the local area and the entire process. We really enjoyed working with Erin who was an amazing realtor throughout the process. We would highly recommend Erin and this team! I’m not sure that the sale of our home could have been handled any better. We were hopeful that we’d sell quickly and at a fair price, but never imagined we’d receive an offer and reach an agreement within a few short days. Lynn and the rest of the team were such a pleasure to work with. We needed good advice, efficient communication and staging expertise – and that’s exactly what we got! Thanks to you all, we are now able to relax out here in our new home in sunny California! Thanks! After 6 months on the market with another agency, Jo-Anne and her team had to make us face some hard realities. They explained everything and educated us in the current market conditions. We were so happy we took their advice. Our home sold quickly after making some adjustments. We would highly recommend using this professional team. Hire a professional and they really can guide you to a successful sale of your home. Thanks! The LaBuda Team is very efficient, professional and helpful in helping the sellers prepare the home for sale. We followed the suggestions to a “T” and voila!, the house sold in a couple of days! Very professional, responsive and communicative! Lynn was awesome as well as everyone on the team! Thank you for all that you did for us during this process! We felt so at ease with you “in charge” of selling our home and appreciate your time, thoughts and hard work very much! We chose your group because of the team approach – each person focusing on one area and doing a great job at that spot. It paid of for us in a quick sale, staging, providing excellent handout information and caring for the uncountable details of closing. Thank you! Thank you all for helping me through the process of selling my home. You kept it as stress-free as possible with your professional experience and speedy actions and responses. I highly recommend your team to anyone who would like a quick sale on their home with available guidance from pre-list to closing! Thanks again! !